Barry Moser talked on Thursday (at the Eric Carle Museum of Picture Book Art) about the parallels and perpendiculars of Alice's Adventures in Wonderland and Through the Looking Glass, and Dorothy's tale in The Wizard of Oz. Much of the talk matched, word for word, the essay "Shadow Plays in Black & White" in Moser's collection, In the Face of Presumptions. Pluses of the talk, though, were additional reflections on the role of illustrators -- including reference to the disservice that illustrators can do by fixing images and preventing readers' visions. Moser also identified many of the American political faces he used as models for the characters. Among them were Alexander Haig, Nancy Reagan, Caspar Weinberger, and Ronald Reagan. (Fear not, both Alice and Dorothy were modeled from Moser's own daughter, a dark-haired gentle face with quiet merriment.) Asked whether he was crafting deliberate political commentary, Moser admitted that he doesn't want story readers to "see" the political characters until or unless someone points them out; he uses them instead to entertain himself during the long hard work of crafting the books! Designing and illustrating the three books (two for Alice) led Moser to reflect on their authors' close connections with death and its implications. Seeing each narrative as one of journeying, Moser quoted Eudora Welty from The Robber Bridegroom: "A journey is forever lonely and parallel to death." He also noted the vast difference in "feel" of the narratives, seeing the Alice work as taking place in "closed space" and te Dorothy as related to the openness of the American Midwest. This significant difference became, in turn, a way to look at the choices in design for the University of California limited editions of the books. The two Alice books, in Moser's hands, evoked Victorian luxury through their half-leather bindings and decorative papers. For The Wizard of Oz, though, Moser and his collaborators used paper over boards, with simple gold stamping on the front panel and a blind stamp on the rear: "No tooled leather and marbled paper for this child of poverty, this child of the prairies, this child of dust." Typography choices drew on similar senses: The page designs for Alice, with their sidenotes, colors, and inserted illustrations, give an effect that Moser describes as "decorated and calculated pandemonium." In Oz, though, he used typography based on the O and Z (presaging the choice Moser would later make with the first page of his Pennyroyal Bible). Blessed with "lots of white space" and executed in black and white, Moser's Oz only indulges in color for the running heads, which cue to the Map of the Marvelous Land of Oz drawn by L. Frank Baum. As designer, illustrator, typographer, and maker of a multitude of choices, Moser exposes his own reflections about life and the texts, saying, "Death presages the feeling of loneliness which to me premeates all three stories." Most of all, he relies on vision, in both senses: "It is through the act of seeing -- and I mean both inward seeing and outward seeing -- that I come to think what I think and make the judgments that I make." Maybe you already have a copy of the 2006 Rachel Hadas collection, THE RIVER OF FORGETFULNESS -- and maybe you heard one of its poems read on Garrison Keillor's Writer's Almanac (9/10/06). Or maybe you made it to the launch event for BEST AMERICAN POETRY 2006 (ed. Billy Collins; series ed. David Lehman), at the New School, with Hadas reading her work. But there's more to come: Hadas reads at the KGB Bar (85 E. 4th St, NYC; a nice neighborhood place with great poetry events) on Monday November 6 at 7:30 p.m. She has a piece in the fall issue of THE COMMON REVIEW. One quick note: Taylor (whose full name always rings a faint bell for me on those old Mary Stewart romantic mysteries) credited a lifetime of reading Dorothy Sayers and Agatha Christie as her roots in mystery writing. Then she added, almost parenthetically, "And of course when I was younger, Nancy Drew." The Nancy Drew series was the "milk" of childhood mystery reading for many women, and certainly was for me, with several other series and a quick jump to British mysteries, adult level, by age 10 or so. Now I'm curious: What's the percentage of this experience? And for the gents out there -- what mysteries were your "training wheels" mysteries? Kudos to St. Johnsbury Athenaeum (Main Street, St. Johnsbury, Vermont; www.stjathenaeum.org and 802-748-8291) for pulling together a rich winter/spring of lectures and authors as its "First Wednesdays" series (Vt. Humanities Council program): Oct. 4, Alfred Stieglitz and the Rise of Modernism (Dr. Alan Fern, retired director of the National Portrait Gallery); Nov. 1, On Dictionaries: Words and What They Say about Themselves (Ilan Stavans, Amherst prof. and lecturer extraordinaire); Dec. 6, Our Bodies, Ourselves: After 35 Year of Women's Health Education and Advocacy, How Far Have We Come? (co-founders of the Boston Women's Health Book Collective Judy Norsigian and Jane Pincus); Jan. 3, Witnesses at the Gate (author Marjorie Ryerson presenting experiences around the dying and death of a beloved); Feb. 7, How the Romans Invented Themselves (Dartmouth Classics prof Edward Bradley); March 7, Why Jung? (author and Jungian analyst Dr. Polly Young-Eisendrath); April 4, Stark Decency (Dr. Allan Koop on the story of New Hampshire's WW II POW camp); and May 2, War vs. Truth: Freedom's Dilemma (journalist Barrie Dunsmore). All are at 7 pm, and the location is fully accessible with a good sound system. Kingdom Books welcomes Nuyorican poet/activist (and UMass Amherst prof) Martín Espada to the Northeast Kingdom on Sunday October 8, reading at the St. Johnsbury Athenaeum at 3 p.m. Espada not only crafts powerful poetry -- he shows how to stand up for justice at the same time. We're also collaborating with the regional independent high school, St. Johnsbury Academy, to host three poets at the school's Grace Stewart Orcutt Library for a second year of our Fireside Literary Series. The 2006-2007 poets are Sydney Lea on November 3, Cleopatra Mathis on March 30, and Kevin Goodan on May 4 (those are all Friday afternoons; poetry starts at 3 p.m. and the school usually hosts a slam poetry session in the evening). Finally, the schedule for this year's Brattleboro Literary Festival, October 6-8, is "up" at the festival web site, www.brattleboroliteraryfestival.org -- and includes Madison Smartt Bell, Martín Espada, Ilya Kaminsky, Sydney Lea, Lisa Olstein, Chard deNiord, Maxine Kumin, Jamaica Kincaid, and more. Don't miss the Saturday afternoon special: Hearts of Spain, Poetry of the Spanish Civil War. Espada, of course, is taking part in this remarkable panel. Mystery & Politics: What a Match! Sarah Stewart Taylor earned a great review in Publishers Weekly for her fourth Sweeney St. George Mystery, STILL AS DEATH. And her husband Matt Dunne took a decided majority in this week's Vermont primary, Democrats of course, for the office of Lieutenant Governor! We'll celebrate with both on Monday September 18 (details on the web site, www.KingdomBks.com ). All the preordered first-edition hardcover copies of this mystery are spoken for at this point, but there's still room for a couple more people at the "politics" part of the event (6 p.m.). Please let us know if you'd like to attend. Tomorrow morning our snail-mail events listing for the fall heads out -- starting with Monday September 18 at 4 p.m. here, Sarah Stewart Taylor, reading & signing STILL AS DEATH (her fourth Sweeney St. George mystery) followed by a 6 p.m. buffet supper to meet her husband Matt Dunne and talk politics (he's running for Lieutenant Governor of Vermont) -- attend one or both! To check out our review of the mystery, see the web site (www.KingdomBks.com); to look at Matt's record and politics, see his (http://MattDunne.com). Just got the photos back, and here's the best: Donald Westlake signing his mysteries at Kingdom Books, with his author wife Abby Adams. 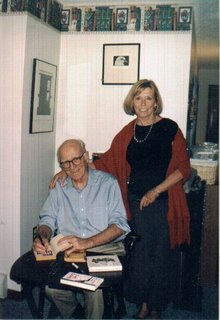 (Her two books AN UNCOMMON SCOLD and THE GARDENER'S GRIPE BOOK were big hits at the event, and she collaborated with her husband on a pair of Mohonk Mountain House mysteries, too.) The two of them were wonderful guests for our "limited edition" dinner. Thank you again, Donald and Abby!